Welcome to the Touring Talkies Cinema Search page formulated by . To built a cinema in a main stream and hub of the city cost lot of financial expenses it sounds OK if cinema business start giving return otherwise it become burden. 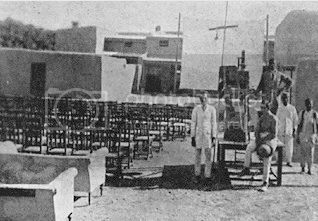 So to address this during the prime era of cinema business, many mobile or cinema without any roof top cinema called Touring Talkies were built in many cities of Pakistan. Mostly these Touring Talkies were built in rural areas to fill the gap in between major cities. Previously it was observed that these Talkies cinema did wonderful business during the peak time of Pakistani film and cinema. But with the decline in cinema industry when the survival of routine cinema was at stake, Touring Talkies cinemas also vanished from the scene. With the passage of time it has reduced its attraction specially here in Pakistan, reasons may be standard of films, condition of cinema houses, prevailing political and security situation of the country or what so ever……………… but here we’ll not generate a discussion on this awful topic rather on this page days would be remembered once silver screen media used to be at his blossom and we saw many Touring Talkies in all over Pakistan which are left almost zero at present. So starting from that period till to date details of Touring Talkies with their current status have been formulated here with the premise which exactly is the aim of .